Strong square parabolic shackle (patented) with very high protection against brutal attacks, e.g. with bolt cutters, car jack or saws. Shackle is double bolted so extremely secure in the patented ABUS power cell. 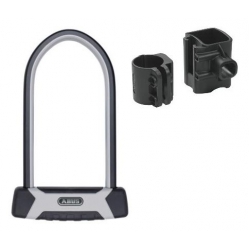 ABUS-X-Plus cylinder for highest protection against intelligent opening methods. Universal carrier fits to frame tubes from 15 mm to 35 mm in diameter. Lock weight is between 1.6 and 1.8 kg depending on the length of the lock. Abus level 15 - maximum protection.